We knew it was coming, exactly 2 years to the date of its original price drop the PS3 is once again getting a price cut, this time down to $249.99. Sony Computer Entertainment boss Andrew House made the announcement at the conclusion of the Sony Press Conference. On the PlayStation blog, SCEA CEO Jack Tretton shared more details. 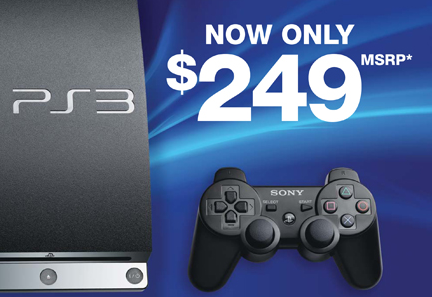 In North America, the 160 GB PS3 and the 320GB PS3 are now available for $249 and $299, respectively. There will also be a limited edition inFAMOUS 2 bundle “at participating retailers.” It” sell for $299 and includes a 320 GB PlayStation 3, a copy of inFAMOUS 2 and a 30-day membership to PlayStation Plus. Posted on August 17, 2011, in News, Videogames and tagged Gamescom, Infamous 2, Jack Tretton, Playstation 3, Playstation Plus, price cut, Sony, Uncharted 3. Bookmark the permalink. Leave a comment.